THE South Belfast PSNI have issued a stark warning to teenagers and their parents after groups of young drinkers brought mayhem to three different areas at the weekend. 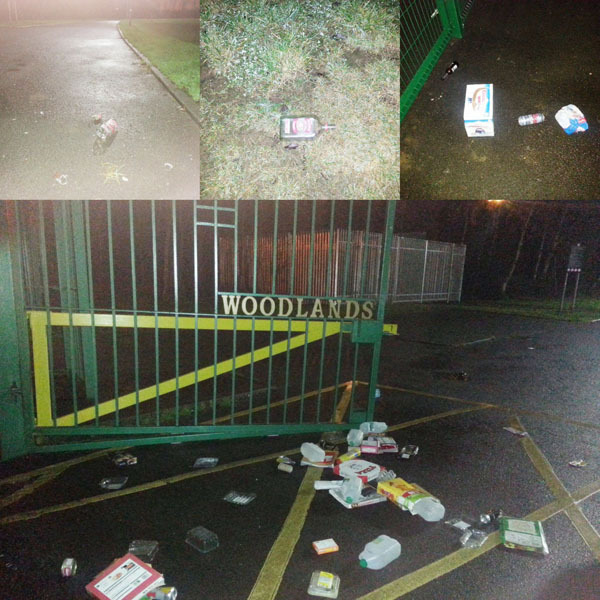 Hundreds of teenagers attacked police at the Market/Waterfront and Sandy Row while a gang took over the popular Woodlands sports area at Finaghy. Posting on the PSNI Facebook page, Constable McCoy said: “This evening [Saturday] brought a group of up to 200 teenagers into the Market/ Waterfront area, again an amount of alcohol and a boom box was seized. Officers had bottles thrown at them. “Then to Blythefield BMX track off Sandy Row with around 160 on Friday 6th, bottles and stones thrown at police, and 30-plus this evening, with some of the group playing loud music and some with alcohol. Chair of South Belfast Policing and Community Safety Partnership and Sinn Féin Balmoral Councillor Geraldine McAteer said: “I am very concerned at the events of last weekend – the numbers of young people on Lagan Walkway and in the Sandy Row area, the attacks on PSNI and also the destruction of property by young people at Woodlands park and pitches. “As Chair of South Belfast Policing and Community Safety Partnership, I have responded in recent months to the ongoing gathering of large numbers of young people at Lagan Walkway. She added: “This is not just a South Belfast issue, it is a Belfast issue. We are seeing large numbers of young people contacting each other through social media and arranging gatherings right across the city. “We have had a series of meetings with Belfast City Council wardens and outreach youth workers in the Belfast area, to look at how we work alongside young people to get them involved in positive social activities and keep them safe from harm and anti-social activity. “Young people need to be aware that things can get out totally of hand through drink, such as the burning of a wheelie bin and damage of property at Woodlands at the weekend. This can result in young people being charged with offences and going through the criminal justice system at a very early stage in their young lives, which will affect them into the future. There are fantastic new facilities at Woodlands which have been paid for by City Council and the GAA and we would all much rather see young people in Woodlands participating in sports rather than burning wheelie bins.